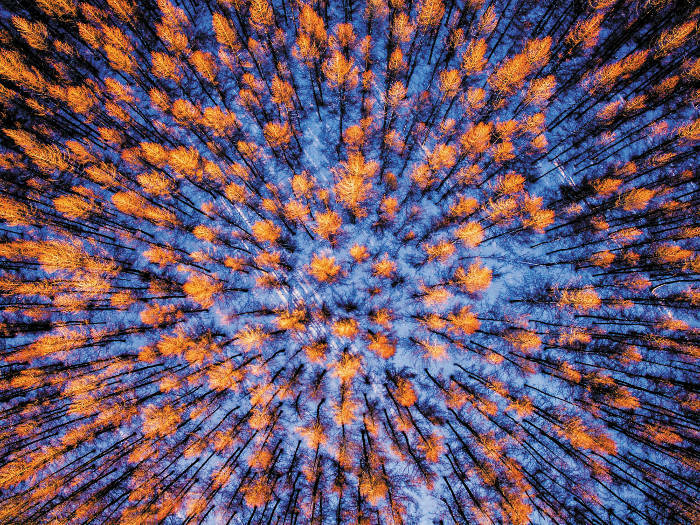 As creatures of habit, humans are wired to look for patterns everywhere and aerial views of landscapes create some of the most arresting. It’s the appeal of the window seat, of helicopter rides, of flying drones. The most populous continent provides a new perspective from up high. Unsurprisingly, man-made patterns are some of the most intriguing. 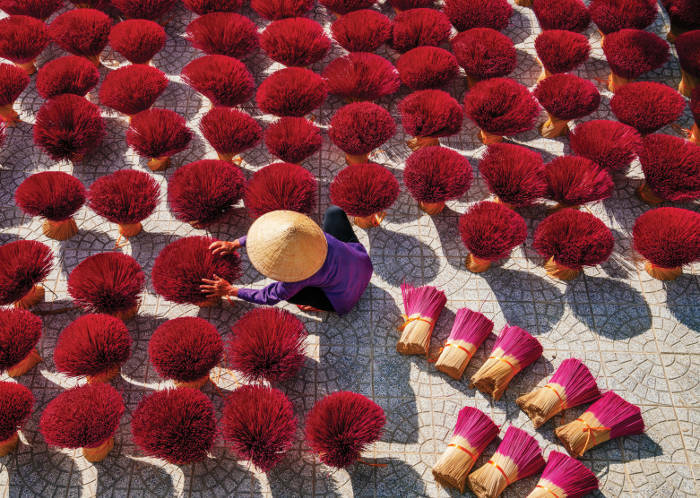 In Vietnam, women fan bunches of incense sticks to dry in the sunshine like blooming flowers. Made from bamboo and coated in plant products and herbs to create scent, incense is used in spiritual practice in cultures all across Asia and beyond, the wafting scent perfuming temples, pagodas, homes and shops. 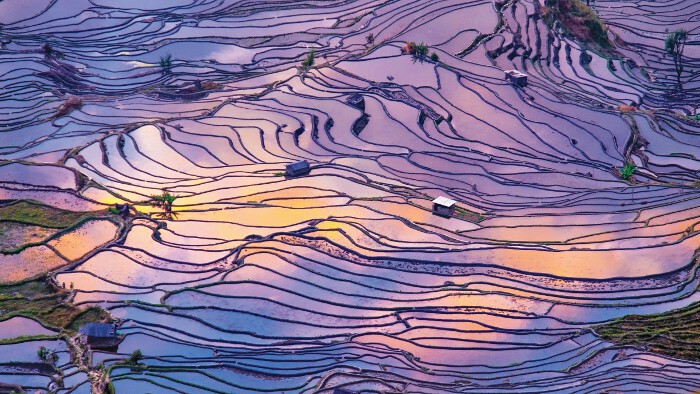 The Honghe Hani Rice Terraces, a spectacular system of layers created by the Hani people that cascade down the Ailao Mountains, covers about 16,000ha in southwestern China. An UNESCO World Heritage Site, there are more than 3,000 terraces between the forest and the valley, creating a complex farming system that supports not only crops of red rice, but also buffalo, cattle, ducks, fish and eels. 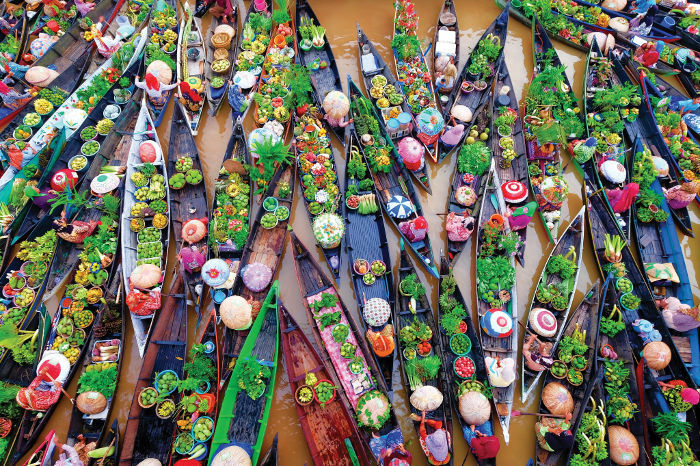 Waterways have long been a lifesource for people throughout Southeast Asia’s low-lying regions with floating markets such as Lok Baintan, on the Martapura River in Borneo, an important sign of the social and commercial health of a community. While rivers were once the sole connection between communities, the advent of modern technology and the development of shopping malls and land-based transport challenge these river-based markets and their communities. Lok Baintain market is run by women aged over 35 and, while it still serves the local community, it has increasingly become a tourist destination. The younger generation may be reluctant to shop at floating markets, but after witnessing the disappearance of similar markets in surrounding areas, these local women have adapted their trade to offer not only fresh produce, but traditional meals and even locally made souvenirs for overseas visitors. Dictated by a vast, arid landscape that borders the Gobi Desert, Inner Mongolia is a mostly rural, autonomous region of the People’s Republic of China. Situated in the country’s north, bordering Mongolia and Russia, animal grazing is the main agricultural economy, while the harsh climate and low precipitation restrict intensive agriculture. Much of the rest of the region is covered by virgin forests, such as these larch trees, which turn a deep golden colour in the autumn before losing their leaves during winter. Most of us live in a world where time is as valuable as money and items are often disposable. For small fishing villages in Vietnam, where money is scarce but time is in abundance, simple acts such as repairing a fishing net by hand is a way of life. 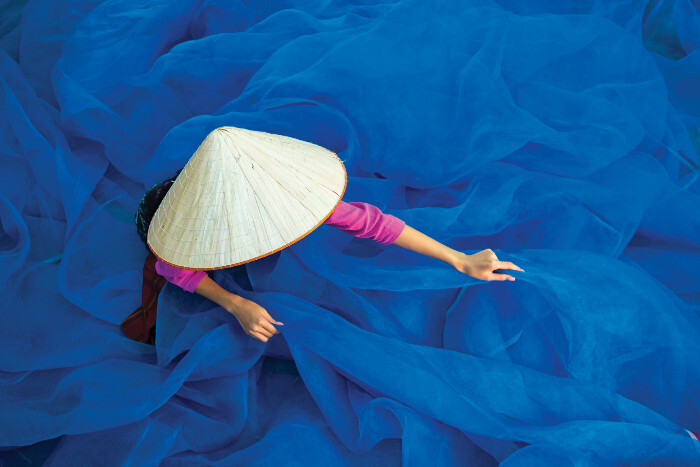 It may take hours, days even, but this is a part of the traditional fishing methods used by villagers along the Vietnamese coastline and in the mighty Mekong Delta. Wagasa are synonymous with Japan, despite the design originating in China before spreading across Asia. 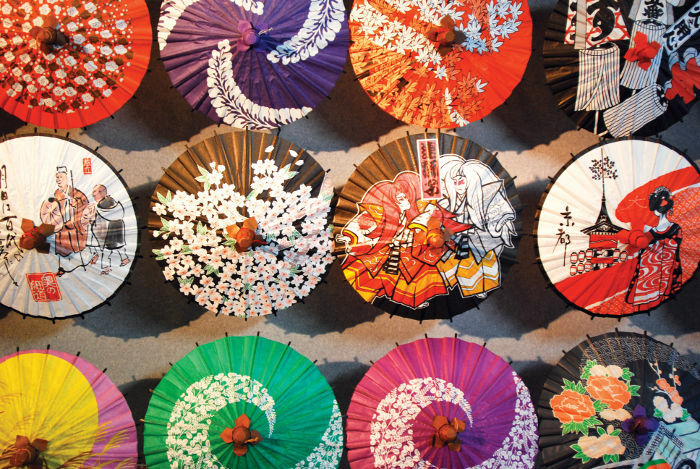 Made from bamboo, paper and sesame oil for waterproofing, the umbrellas are mostly used for traditional dances and outdoor ceremonies; craftsman often adorning them with detailed drawings and motifs. They are so much a part of Japanese culture, there are even spirits, known as karakasa-obake, said to appear from the wagasa. 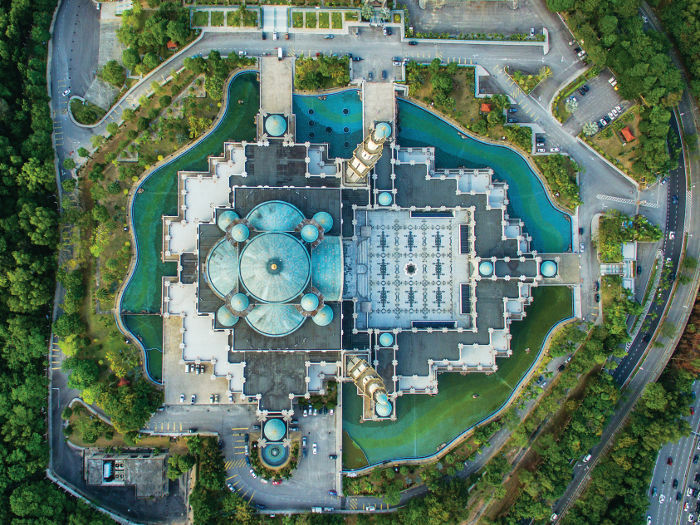 It may have only opened in 2000, however the Federal Territory Mosque (Majid Wilayah Persykutuan) in Kuala Lumpur is a distinct blend of Ottoman and Malay architecture, heavily inspired by the Blue Mosque in Istanbul. Covering a 5ha site, its 22 domes stand above the huge main prayer hall that can accommodate up to 17,000 worshippers at a time. 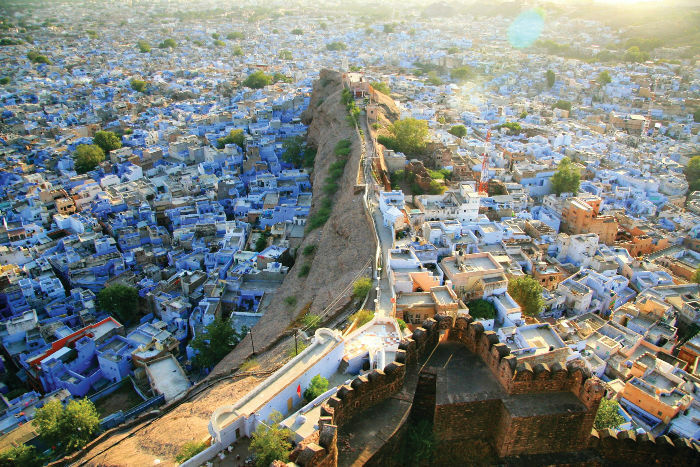 Walking through the patchwork maze of Jodhpur’s old city, where breezes tunnel along shaded streets and buildings are painted the blue shade the city is famous for, it’s easy to forget you’re in the middle of a desert. Like some cities in sultry Morocco, houses in Jodhpur are painted blue – a cool hue against the heat of the Thar Desert. In contrast to the sea of blue buildings below, the earth-coloured 15th-century Mehrangarh Fort, now a museum, towers over the city on a rocky outcrop. No artist creates an image quite like Mother Nature. 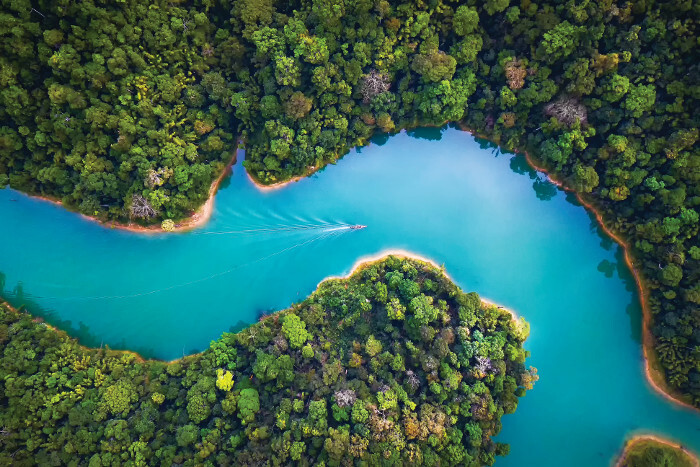 With the vibrant blue waters cutting a serpentine shape through the verdant green of the rainforest, Khao Sok National Park in Thailand is one of her best works of art. Khao Sok is quite literally an adventure lover’s paradise, and can be explored by hiking, rafting, canoeing or kayaking. The national park is home to dense virgin rainforests and a number of rare native species, including tigers, gibbons and hornbill birds. 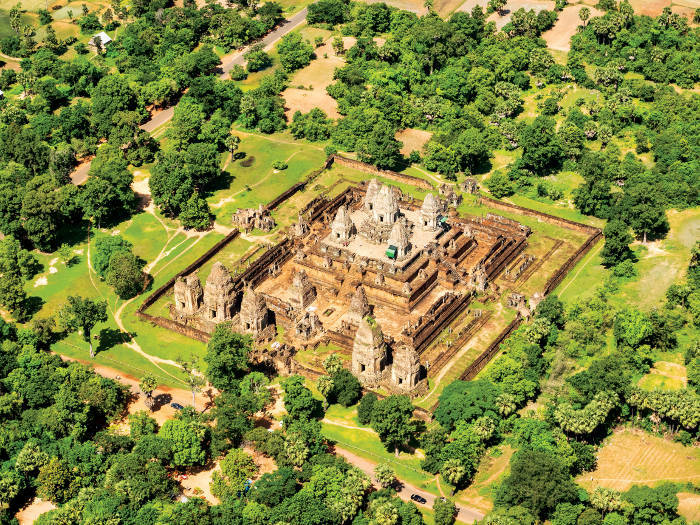 Iconic for its grand scale and elegant detail, Angkor Wat is the world’s largest religious monument, covering 162ha. Dating back to the 9th century, the temple complex was first a monument to the Hindu god Vishnu, then transformed into a Buddhist wat (temple) in the 12th century. Angkor Wat is just one of more than 1,000 temples in the area that was originally the city of Angkor, thought to be the largest pre-industrial city in the world. This article originally appeared in Flight Centre Australia website. This post originally appeared on Flight Centre Australia.